If you don’t already know this, I’m a huge fan of chocolate cake. Doesn’t have to be fancy chocolate cake–HEB $5 cake will work, Betty Crocker out of the box will work, and yes, chocolate cake made from the best dutch cocoa in the world will work too. Because I love chocolate cake so much, I’ve never been that big of a fan of brownies because either the consistency is too chewy and tough or they are wayyy too sweet for me to eat more than one. Maria brought some brownies into work a few months ago and they literally were the best brownies I had ever tasted. Literally. Maria gave me her recipe and I made them myself. I shipped half of the brownies to Chicago, ate about a quarter of it myself at home, and brought the remaining quarter to work. So delicious. When I told Maria that I didn’t use all the amount of sugar the recipe called for, she asked me, in a seriously perplexed tone: “why would you do that?” me: “oh, just to cut back on the sweetness factor.” maria: “again, why would you do that?” i love maria. Below is the original recipe, taken from Cook’s Illustrated. The recipe with the full amount of sugar. Makes 24 2-inch brownies. Make a foil sling (layer two pieces of foil–one going widthwise, the other going lengthwise–so that there is excess overhang on the pan edges). Spray with nonstick cooking spray. Whisk cocoa, expresso powder, and boiling water together in a large bowl until smooth. Add unsweetened chocolate and whisk until chocolate is melted. Whisk in melted butter and oil. Add eggs, yolks, and vanilla and continue to whisk until smooth. Whisk in sugar until fully incorporated. Add flour and salt and mix. Fold in bittersweet chocolate pieces. Scrape batter into pan and bake for 30-35 at 350 degrees. Transfer pan to a wire rack and cool for 1.5 hours (crucial). Using foil overhang, lift brownies from pan. Return brownie to wire rack and let cool completely, about 1 hour (crucial). Cut into squares and serve. Cutting tip: Use a cheap plastic take-out knife–crumbs don’t stick! 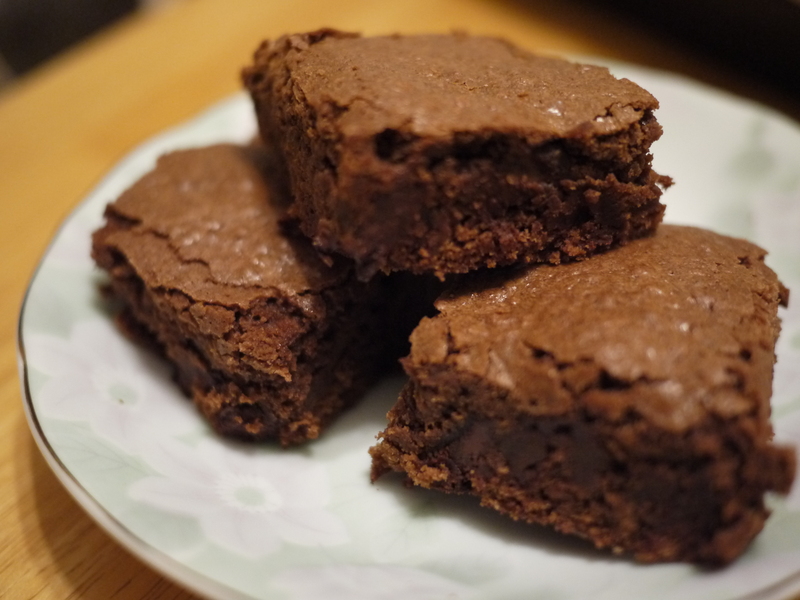 Maria warned me that these brownies are so good that they’ll make a boy fall in love with you. Cooooool.